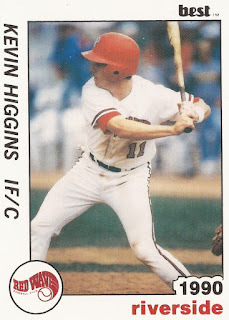 Kevin Higgins made his major league debut in this May 1993 and he wasted little time getting his first big league hit. In the top of the second inning, Higgins knocked a double in his first major league at bat, scoring two, according to The Associated Press. "It was overwhelming," Higgins told The AP afterward. "My legs were shaking and my heart was pounding. I was lucky to get wood on the ball." Higgins debuted with the Padres that year in his fifth pro season. He got into 71 games and hit .221. That season turned out to be his only season in the majors. Higgins has since put his experience as a player to use as a coach in the minors and in college. One of his college pupils at the College of Southern Nevada: Bryce Harper. 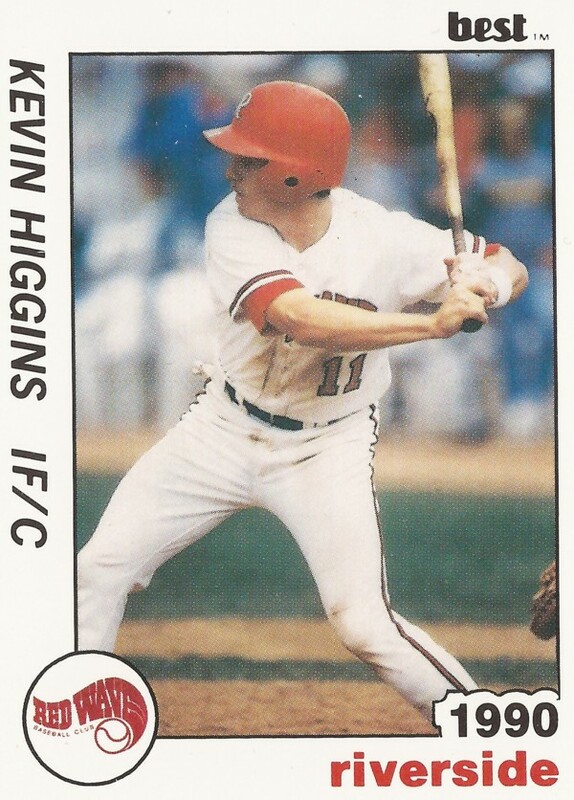 Higgins' career in baseball began in 1989, taken by the Padres in the 12th round of the draft out of Arizona State University. Higgins started with the Padres at short-season Spokane. He hit .332 over 71 games. He split 1990 between high-A Riverside and AA Wichita. He also got nine games that year at AAA Las Vegas. Higgins played both 1991 and 1992 completely at Las Vegas, hitting .288 his first year there and .254 his second. He then made San Diego in May 1993. Higgins played largely at catcher, also getting time elsewhere. He picked up a total of 40 hits in 181 at bats. He singled and scored in a July game, helping keep the Mets' Anthony Young winless. Higgins drew praise that June from his catching coach Bruce Bochy, according to The Los Angeles Times. "His head's into the game," Bochy told The Times. "He's a listener. His instincts behind the plate are so good, his lack of experience doesn't hurt him. He's an old-school baseball player. He's got a lot of enthusiasm and he works at it." Higgins returned to the minors for 1994, playing at AAA Las Vegas. It was his final season as a pro. Higgins soon started his coaching career in the minors. He served 1996 and 1997 as manager at short-season Vermont. He later served as hitting coach at Staten Island and Mahoning Valley and manager at rookie Burlington in 2006. He then returned to college, serving as assistant coach at the College of Southern Nevada, serving as a mentor for Harper in 2010. Since 2011, Higgins has served as assistant coach at UNLV. Higgins told The Mountain Insider in 2012 he believed college players seem more willing to listen. "Sometimes they look at me funny like, ‘How do you know all this?'" Higgins told The Insider. "It's not like I invented any of this stuff. I got to learn this stuff from guys like Rob Picciolo and Bruce Bochy and lots of big leaguers. I'm just passing it down."